Last year I had the chance to spend some days at the Dead Sea and it's where I first fell in love with the beauty of Jordan. I've been wanting to go back ever since and so now, fast forward one year later, the opportunity arose out of the blue and I didn't think twice. I met my friend from my previous year while there and with him being a local, we visited all the best spots (all non-touristy, woop woop!). And since I had already experienced the sea, we decided to go to the more desert side and discover the gem called Wadi Rum. So - what is Wadi Rum? Located in the southern part of Jordania, this magical place is a preserved valley that takes you back to the simple way of living. Once arriving in the Rum village, you must say goodbye to all modern life. A local picks you up in a truck (one that makes you wonder how you'll even make it down the street) and off you go into wild desert. No lights. No other cars. Literally nothing whatsoever - just you and the nature around. After about a 30 minute drive into the middle of nowhere, you arrive in an area of just a few tents. The moment the car engine turns off, you go into a slight state of shock. It is so quiet that you can hear the sand scraping against your feet as they press into the ground. To my surprise, people live here all year round too - they are called Bedouins. 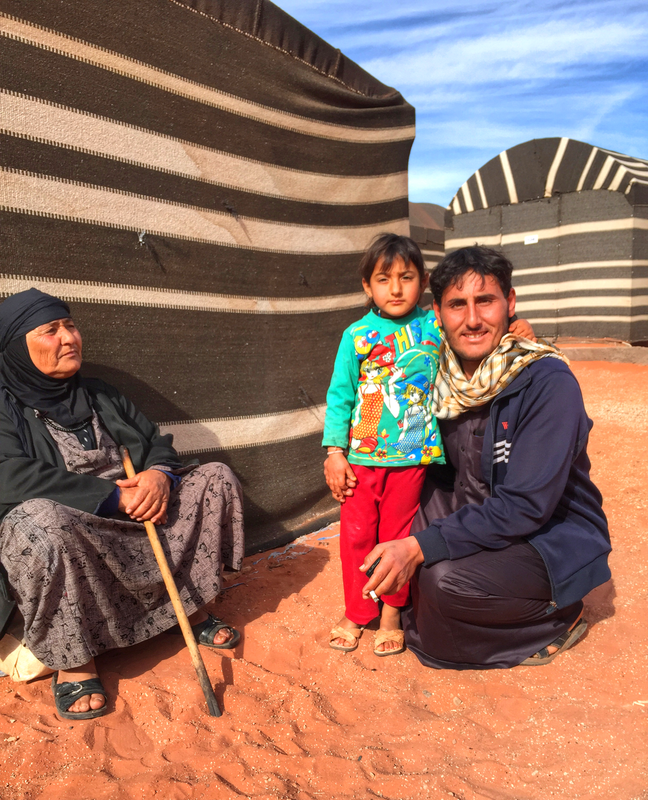 I was fortunate enough to meet a small Bedouin family living in the camp. The only English they spoke was "hello" but this along with a smile was all we needed to make a connection. They were kind enough to invite me in their tent for breakfast, which consisted of breadstick-like cookies dipped in tea. This was the real deal when it comes to cultural immersion. I'm a sucker for anything non-touristic in travelling, which is why I love hanging out with the locals. Not only do you get to know their culture first-hand but they always know the best spots. 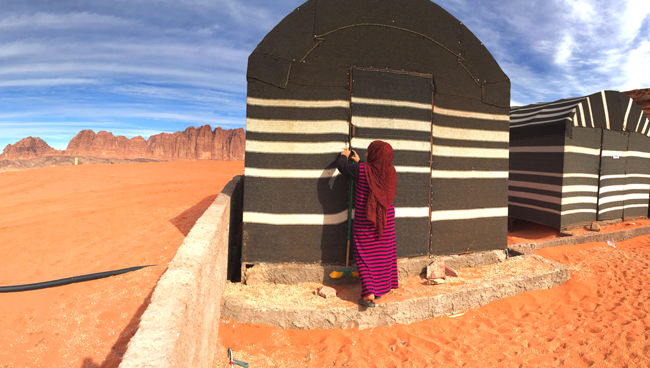 Although there are many camps in Wadi Rum, the Bedouin Camp was particularly ideal - clean, traditional, and scam-free. I highly recommend it. Tip: You can sleep in your tent but what's even better is walking away from the camp with the thick blankets provided and sleeping in the desert under the magnificent stars. Trust me, you won't see this kind of sky anywhere else. Throughout the desert, you will find tents with Bedouins who sell locally sewn garments, jewellery, and other neat items. Here, I met a henna artist who was kind enough to offer a tattoo - something that cannot be declined! One of the most incredible moments in travelling is when you get to know the real locals - not the ones who are just trying to be nice to sell you something. I'm talking about the people who are naturally living their everyday life. Writings from different tribes that inhabited the area since prehistoric times can be found on the rocks. Can you imagine having to find your way around a desert by following the symbols left in random places? And to think we have trouble getting to the city next to us without GPS systems.. spoiled bastards we are. Once a henna tattoo dries, the thick paint slowly starts to come off. That’s when the true beauty of it comes alive. All in all, Wadi Rum is simply one of those magical places you have to experience at least once in your lifetime. It is the true essence of nature, tranquility, and adventure all in one spot. Sure, you can get to understand a culture through books and online research but trust me when I say - nothing beats discovering it through your own eyes. This way, you can make your own story, which will forever be unlike any other. 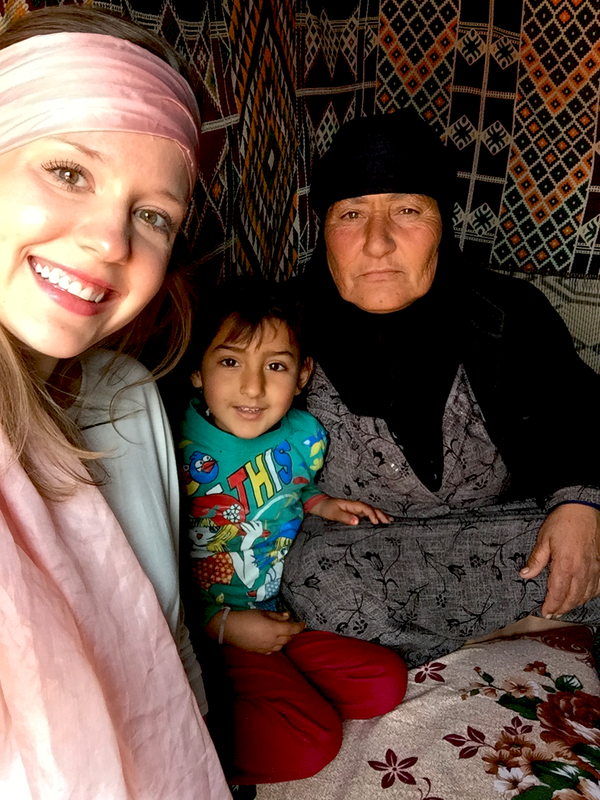 My #1 tip to have the best experiences when travelling anywhere: meet and talk to as many locals as possible. Not only will you make lifelong, international friends this way but you will also have cultural experiences like no other. And this my friends is something you will never find in any book or website.